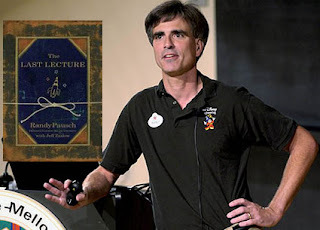 Randy Pausch died today. He was 47 years old, an expert in his field, a professor, son, husband, a dad. He raised awareness for pancreatic cancer research and his "last lecture" delivered to students at Carnegie Mellon sits on the best seller list (The Last Lecture). His fierce determination, wit, candor, and love for his family was shared with the world on Oprah, Prime Time, Good Morning America, several newspapers, magazines, and more. He died of Pancreatic Cancer. He fought a valiant battle and left an amazing legacy to his children and to society in general. I know the stats for pancreatic cancer. They are incredibly grim. Once it has spread, you won't get better...it is a brutal form of cancer. Pausch had beaten so many odds during his courageous fight. I almost erased the statistics from my head and thought he would be that one miracle who defied all of the odds. Dr. Pausch was a crusader in every sense, a real hero. The quote above is appropriate. It is one mentioned to me by another journalist when my father died--a quote taken from Dead Poets Society in a scene where the professor used it to inspire his students. "The Last Lecture" is a testament to this. Pausch's words have had, have now, and will continue to have a lasting impact. Everyone who knows me knows how my own life has been touched by Pancreatic Cancer. My dad was diagnosed with Stage 4 pancreatic cancer at The Mayo Clinic in late October 2004--right when we found out we were expecting Benjamin. Dad died 3 months later. He had just turned 56 the month before. The doctors told him at the time of diagnosis that he had less than a one percent chance of living 1 year. Those are staggering odds. They told him he had about 3 months...best case 3-6. Not long after Dad's death I started researching different charities for pancreatic cancer research. The one I am most passionate about is THE LUSTGARTEN FOUNDATION. They are a wonderful group of people who are truly passionate about finding a cure through research. Did you know that Pancreatic Cancer is one of the most underfunded in terms of research spending, yet it is one of the deadliest forms of cancer out there. I am making a pledge right now to go on a total etailer "NO BUY" in AUGUST 2008. The money saved that month will go right into my fund to donate to Lustgarten. I made a similar pledge about putting money into savings and also into charity (which made it to the Lustgarten's Purple Prose page on July 18th, where they also mentioned our other efforts) at the end of June. I would also like to announce that in NOVEMBER, I will be donating FIFTY PERCENT of the profits from my Etsy shop ALL MONTH LONG to The Lustgarten Foundation in honor of Pancreatic Cancer Awareness Month. I will continue to plan smaller events as well, along the lines of my June 2007 Soaps For Hope or December's Light a Candle for Hope. For a bigger event, I plan to have our second "A Day of Hope and Giving" January 29, 2009. The first time we held that event, over $500 was raised in that single day. When fall comes, Dad's Pumpkin Pie scent will be offered again in several items, and 100% of the proceeds of the scent will be donated. Right now in my shop, Dad's Margaritaville is available in 3-in-1 Hair & Body Wash and Dry Oil Spray. That is my scent of the summer where 100% of proceeds of sales of that scent will be donated. It is a great scent, by the way...a salty margarita with lime essential oil! I will soon be putting up a special category in my shop of special products which will benefit this foundation all the time. Like I said, every little bit helps!